A while back, I published an article on how to make an Area Cliff Chart. Now this isn’t a standard chart type. 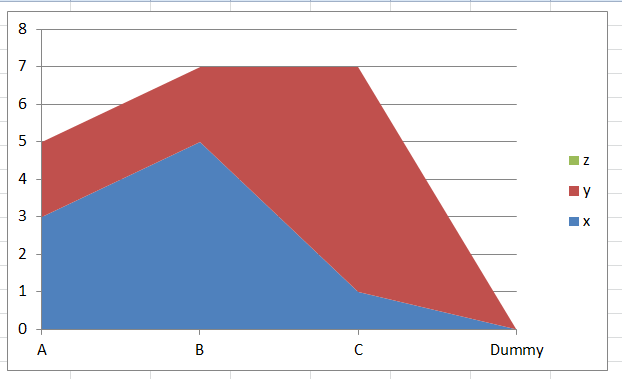 But, I recently saw a comment on my website asking how to do this with an Excel Stacked Area Chart. It turns out that you can’t use the same fix for a regular area graph as the option is greyed out. 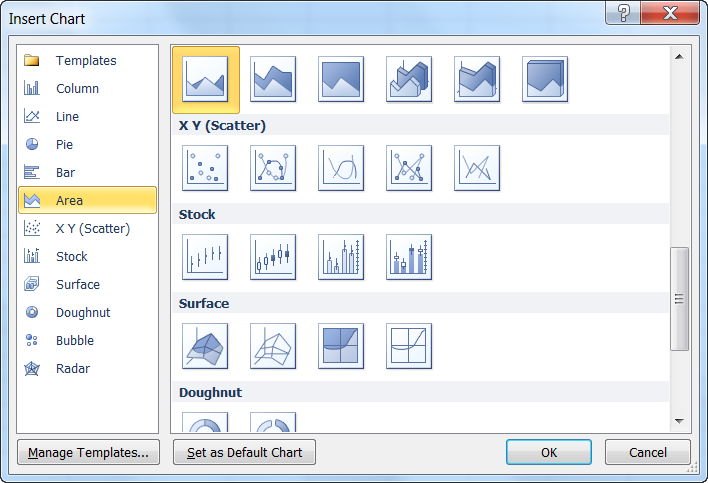 Below are the steps to create the following Stacked Area Chart in Excel 2007, Excel 2010 and Excel 2013. In a regular Area Chart you do not need a dummy series, however, with a Stacked Area Chart, you will need an additional blank or zero value chart series. 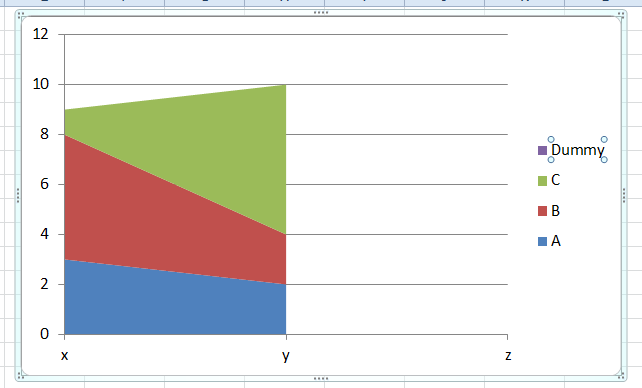 In this example, we will set up our data like this with an additional series that we need to hold the empty Z series. Also, because the values of the Dummy series will be treated as zero, you won’t be able to see this series on the chart. Why Does Excel Switch Rows/Columns in My Chart?Why Does Excel Switch Rows/Columns in My Chart? To switch the rows/columns, click on the chart and then click on Design Ribbon and then click on the Switch Row/Column button in the Data group. Besides the dummy series (which will stop Excel from hiding the Z category,) this step will create the cliff in the Stacked Area Chart. What we need to do is to reduce the size of the A, B and C series by one less column. You can do this in 2 ways. 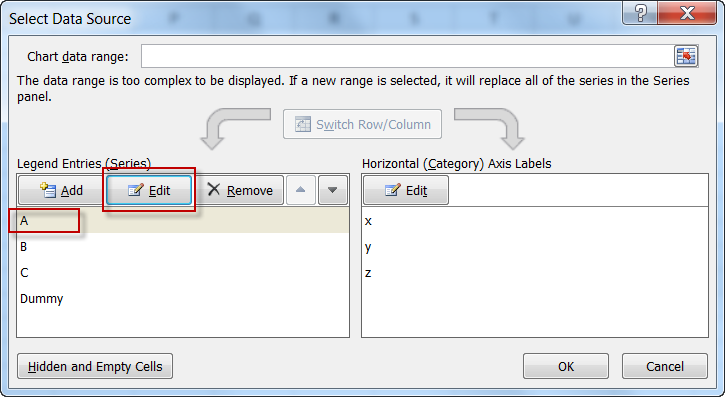 B) You can also edit each data series from the Worksheet by clicking on the chart, then select a single data series. Then you can adjust the series with the selection your mouse on the quick select controls. We just have a little chart clean up left. No one needs to know that we added a dummy (blank/zero) series to the chart. So to hide it, we need to remove the reference in the Chart Legend. To do this, simply click on the chart, then click on the legend and then click on the “Dummy” legend entry and finally, press your delete key. Do you think that if a series is blank that it should be given a zero value? I don’t. I think we should still have the ability to choose with the Gaps option. Let me know your thoughts in the comments below. Thanks a lot for the explanation. I was wondering if there is any way to Make an Excel Stacked Area Chart Cliff at the beginning at different points? I mean your data starts from different years on the horizontal axis and you need to have a cliff for each of the series in the stacked area chart at the related year. Is it possible? If the question is not clear I can send you a sample file.